"Providing unbeatable grip for all your items"
Dycem Non-Slip mats provide a secure surface that anchors items effectively in place. Dycem Non-Slip Mats are ideal for use in the home, office, laboratory, boat, and caravan. 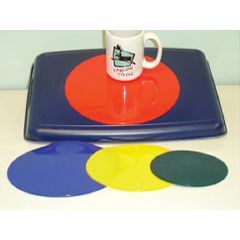 Dycem Non Slip mats are available in a variety of shapes, sizes and colours. Colour contrast is important for many partially sighted, elderly people as it helps to make items easier to see against work surfaces. Placing a white bowl under a brightly coloured Dycem mat will help make it easier to see as well as making the bowl more stable. thick strong material. stays put. holds items in place. holds drinks in place. holds plate in place.